Landmark PLC, Certified Public Accountants is pleased to announce it has been recognized by the United Way Fort Smith Area as the recipient of the 2018 Excellence in Community Leadership Award. The award honors local businesses and their employees for their investment in United Way initiatives. 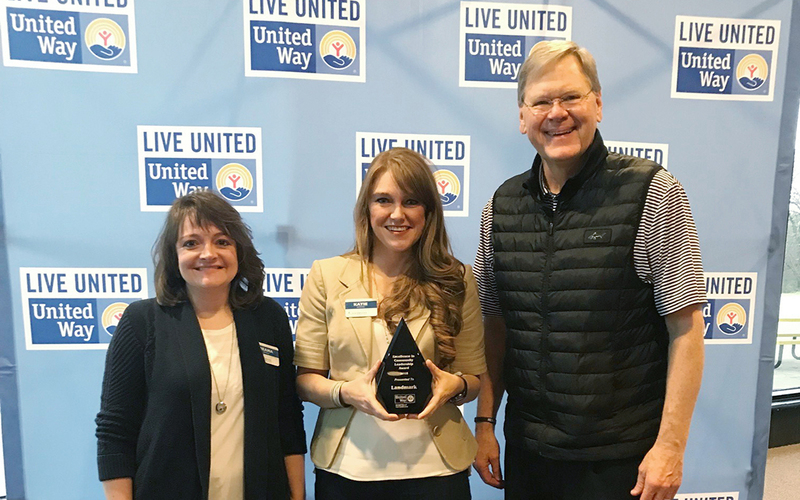 Landmark received the award during the United Way’s annual Community Impact and Investment Celebration held on March 29. Throughout the year, Landmark hosts annual United Way campaign presentations and holds special events benefiting United Way’s Community Partners. Employees of Landmark donate their time and expertise by serving on the United Way Board of Directors and special committees, and employees have the option to donate to the United Way through payroll deductions. “At Landmark, our employees have a long tradition of taking active roles in our community by giving back and contributing their time to charitable endeavors. Each year, our employees spend hundreds of hours volunteering for charitable organizations, serving on boards and participating in activities that benefit our area. We are proud of our team for this recognition, and we celebrate their continued commitment to making our community a better place,” said Business Development Director Rachael McGrew.